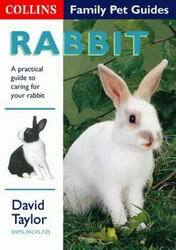 This guide to caring for your rabbit is full of practical advice. All aspects of everyday care are covered but in addition there are lots of interesting facts and anecdotes about one of Britain's most popular pets. It is estimated that there are nearly 1.4 million pet rabbits in the UK today. There is information and advice on varieties of rabbits, acquiring and choosing a rabbit, housing, feeding, grooming, handling and breeding. Dieses Buch ist völlig problemlos über amazon.de zu beziehen.